Selling antiques on the internet can be fun and highly lucrative. Using internet auction sites means you can sell your antiques at a low cost with no risk and you can start anytime that suits you. If you are considering selling antiques on the internet you should be aware that there are a great many on-line auction sites and that ebay isn’t the only venue available to you. Most other internet auction sites are trying to make the selling process as easy as possible and are actively seeking your business. In addition there are plenty of specialist internet auction sites that attract specialist collectors and can help you achieve better prices than the all encompassing, sell everything under the sun, sites. 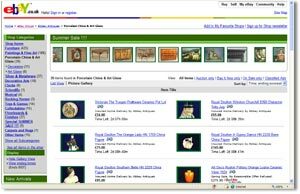 A profitable internet auction business is as close as your basement, attic or cupboard. Just a fantasy? A few years ago, that might have been the case only the internet professional had a chance. But not anymore. Now you can use the internet to turn that dream into a reality and build your own auction business, selling whatever you want to. Just list one or more of your less-treasured items at eBay and you’re on your way. You don’t even need to drive targeted traffic to your listing. eBay pulls in potential buyers for you and you get to belong to an exciting community that shares similar interests to yours. Actually, that’s the way most people get started and continue to list auctions. It’s also why they end up quitting in a few years. eBayers eventually realise that they haven’t built their own business and have instead merely become de-facto employees of eBay. Remember, an internet auction business isn’t a get-rich-quick scheme. It requires real work, just like any other real business. You have to find stock, list your auctions, take payments, then package and post your items. But the profit is there… big time, if you want it and especially when you follow the real business approach. To build a successful Internet auction business you need a positive can-do approach and a popular, preferably unique product to sell. If you don’t have a unique product then selling antiques and collectables is a superb way to start. Stock is plentiful and easy to come by and there are a plenty of good read books you can use to educate yourself on what to specialise in. Most sellers expect you will bargain for the antique you like and that is included in the price tag. You should be able to knock off a 10% from the total price. However a discretion and politeness is recommended, surely if something is already reasonably priced there is no need to push your luck. Also some sellers are more shy than others and you could make them feel uncomfortable with bargaining, that isn’t to say you shouldn’t try if you think the price can be better, but be diplomatic about it. – Make sure you look for invitations to future antique fairs laying around the tables. This way you will save yourself the ticket entry that each antique fair asks for. To ensure there will be enough people on such fairs and that regulars will keep coming the Antique dealers on the fairs distribute free invitations to future antique fairs. Check out our Antique Fairs and Auctions Calendar for regular sources of quality stock to help you start your online business today. Many locals would go to their nearby Antique Shops and leave their antiques on concession and such items are not always spotted for the treasures their are by the Shopkeepers or by the owners themselves. However do aim for smaller towns and villages, in big cities like London for example experience shows that it’s harder to come by something which is not already top price.